Many people are intimidated of the thought of running 26 consecutive miles. Even more people may be intimidated of running those 26 miles at a 5:47 average pace. But as I walked into OK Runner in Norman on a rainy afternoon I met a man who is not scared of those numbers and performed in such a way to win the 2015 Oklahoma City Memorial Marathon. Scott Downard was working at OK Runner the day I happened to stop by and he was eager to help me with a question I had about some running apparel. As I paid closer attention I realized he looked familiar from the television coverage of the recent OKC Marathon, so I had to ask. 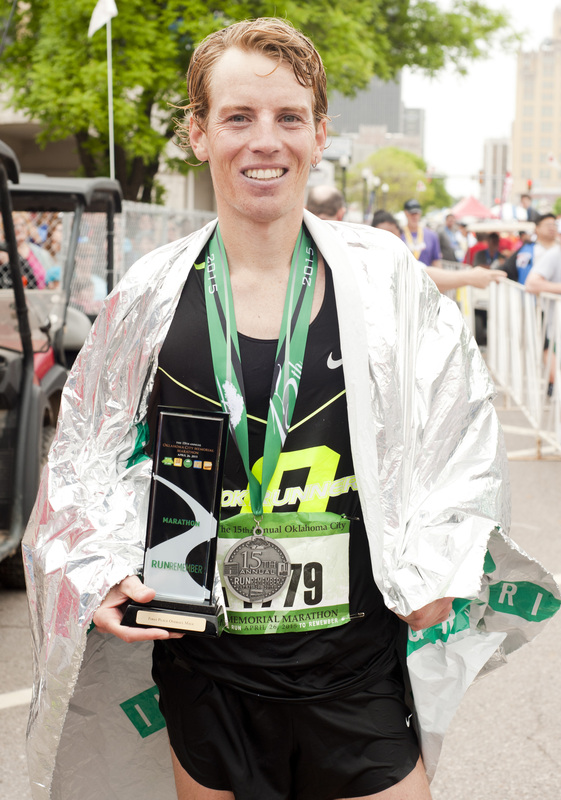 He shyly admitted the he is THE Scott Downard and HAD recently won the OKC Marathon. Being a running fanatic, I must admit, I was a bit star struck. But really the best part of meeting such a notable athlete and runner was that he was extremely humble about his racing victories and seemed very content to just chat with me about running in general. After our brief chat, Scott was happy to answer some questions for the readers of Run Oklahoma. I’m sure most of you, like me, are curious about what’s it’s like to be such a fast runner. Q: How long have you been running? Was it a big part of your growing up? A: I’ve been running for half of my life, 16 years. It became a big part of my life in high school. Running is one of those pursuits that for some people can become an obsessive type of pastime. The first season I ran cross country, I wasn’t particularly good and my work ethic wasn’t great either. But I buddied up with another guy that was a lot better than me and he kind of helped instill some of the “OCD” runner behavior. I do get a little frustrated because I see a lot of the kids I coach and know they have every bit the capability I had and they just won’t commit to the training. That is the only thing that allowed me to get better and in a relatively brief period I could contribute to my varsity team. I view this sport as a lifestyle and I think it can be pretty cool to catch fire with a pursuit like this. Q: What inspires you to run? A: I’m inspired to run on a variety of levels, I mean I like being fit and healthy and getting outside and exploring. I like the challenge it can offer, I like pushing boundaries and I like that I can figure a bit about my body and tinker with the variables and possibly refine the outcome of my effort. I like being around people that are into it for these reasons. I don’t necessarily like the competitive aspect, it’s more of an innate challenge for me. 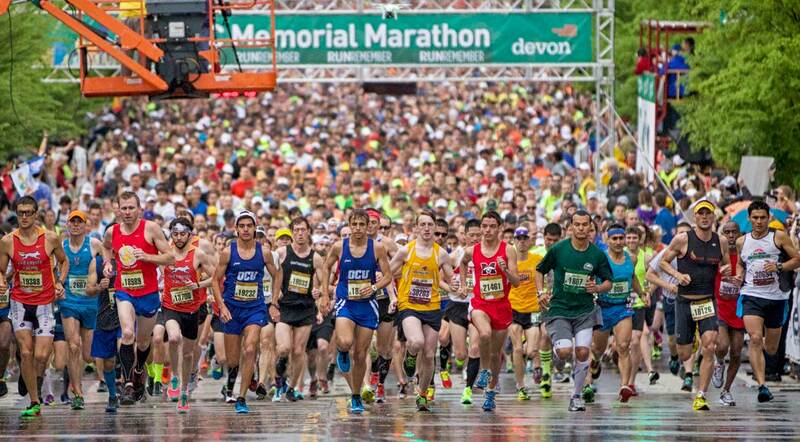 Q: How many marathons have you won prior to this one? A: I actually own and set a course record at the Eisenhower Marathon 2 weeks prior to OKC. Full disclosure, there was a slight issue with one of my wins which I will attach an interview I did about that and not leave it to some of the less informed articles that later appeared. http://www.runnersworld.com/elite-runners/dqed-marathon-winner-explains I also own and set the course record at the Lake McMurtry 50k trail run. 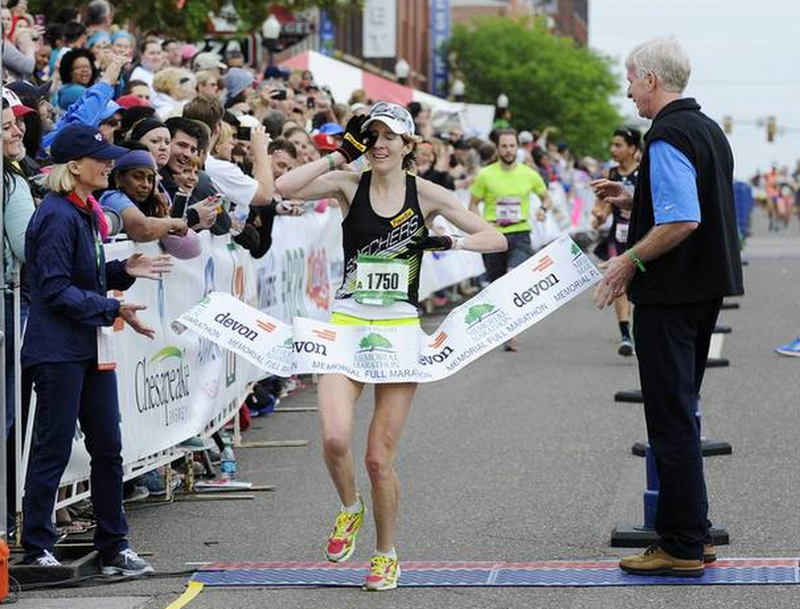 Q: What did it mean, to you, to be able to win the OKC Memorial marathon? A: I was happy to FINALLY win. I’ve given it a go there a few times and was fortunate to get the W. I never take anything for granted in marathons. People ask me about meaning beyond the victory and I obviously understand the significance of the bombing commemoration but this is also THE Oklahoma race that has started to mean a lot for fitness in our community and state. I think that’s the way I view the event, a great event that I hope continues to evolve and grow, there definitely room for that. Q: What was your plan of attack for the OKC course? A: I planned to race whoever showed up, but potentially run a little more conservatively and ramp the pace down the last 10 miles. I wasn’t really able to pull the speed down but you race to the course and your competition. Q: It was reported that you had an asthma attack during the race. Is that true? How were you able to cope/recover? A: I was having gradually worsening asthma problems the last 6-8 miles. I have dealt with it before in spring races and so I packed my inhaler. I’ve had some previous races derailed and it can make for a demoralizing and lonely last 10k. The inhaler is as much of a psychological tool as physical. I’m learning to try to breath and run a little differently to try to cope as well. I think it made the pace feel more difficult and thus my stomach was a little more unsettled. These things are all linked so I couldn’t fuel as well as could have been hoped and hydrating was not great because I feared a side ache. Q: Were you able to take a moment during the race to enjoy the hometown crowd? A: I enjoyed the support but I was motivated to win and not entirely confident of my chances, so you try to conserve your energy mostly. I threw out lots of smiles, waves, and a few high fives to some buddies. Q: How did you celebrate after the win? A: I was somewhat dehydrated afterward which upsets my stomach and a lot of the post race options provided don’t do it for me. I finally got my miracle cure, beer, far too much later and things started to improve from there. My family and girlfriend know that I sometimes am in a rough state after and so when we go out if I say that I need to lay down or am feeling nauseous, they know I’m serious, but usually it can pass fairly quickly once I absorb some fluids, but too much sugary sports drink or plain water usually exacerbate the problem. I basically ended up throwing up what I initially tried to get down, laying on the couch at Mcnellies until they finally brought me a beer. I didn’t do any massive celebrating but I did chat with friends and my buddy, and last years winner, Jason Cook and I usually go get a celebratory drink or 2. I also have to point out that my high school English teacher and her family happened by us and she bought me a pint(so far my most substantive reward, as OKC offers zero prizes for winners) and said she had seen the tv coverage of the race. I’ve also received a ton of congrats from old friends, family, acquaintances, random Facebook friend requests, etc. We also had a get together this past weekend with my coworkers including Scott Smith, who won the 1/2 to celebrate everyone’s OKC experience. Q: What’s your dream race that you’d want to run? A: I would like to run a couple of the marathon majors(Berlin, Tokyo), some really cool destination events( Big Sur, Avenue of the Giants,etc), and a few of the big trail ultras. I’m still attempting to get faster and attempt some longer events, I’m 32, but I also like to travel and make the most of my races. I still think it’s important to mix up your race schedule at times and prepare specifically for goal events a few times a year. A: I’m trying to get in some faster 5/10k type training this summer and then be fired up about training for a fast fall marathon(maybe 2) like Chicago, Philly or Cal international marathons. I had interest in competing at the US 50mile(an as yet unattempted distance for me)champs which are taking place in northern Wisconsin, where my girlfriend is from, but the high school coaching season won’t be conducive to that feat. Many of us dream about just finishing top three in our gender or our age group in a race, and can’t even fathom winning the whole shebang. Scott has managed to take the title in many races and still has his sites set on further achievements. Good luck to Scott in his future efforts as I’m sure the Run Oklahoma Community will be following and cheering along.